While a police operation conducted on Tuesday exposed the links between the Bolsonaro family and Rio de Janeiro militiamen, there is nothing new about the relationship between criminals engaged in the Brazilian organized crime and the Bolsonaro clan, whose members hold offices as federal and state representatives, as well as president. Not only did senator-elect Flávio Bolsonaro employ the mother and the wife of a militia chief from Rio das Pedras, western part of Rio de Janeiro, in his office when he served as state representative, the eldest son of president Jair Bolsonaro has also appeared in photos next to other criminals who operate in the city’s poor communities. In August last year, the “Fourth Element” investigation, which targeted police officers accused of crimes such as extortion, arrested the military police officers and twin brothers Alan and Alex Rodrigues Oliveira. The cops are the siblings of Valdenice de Oliveira, treasurer of the Bolsonaros’ Social Liberal Party (PSL) and aide to the party leader in Rio’s state legislature. At the time, Flávio spoke with the newspaper O Estado de S. Paulo and denied the allegations that the twins were members of his political campaign for Brazil’s 2018 elections. But Valdenice revealed that her brothers were volunteers in the campaign. 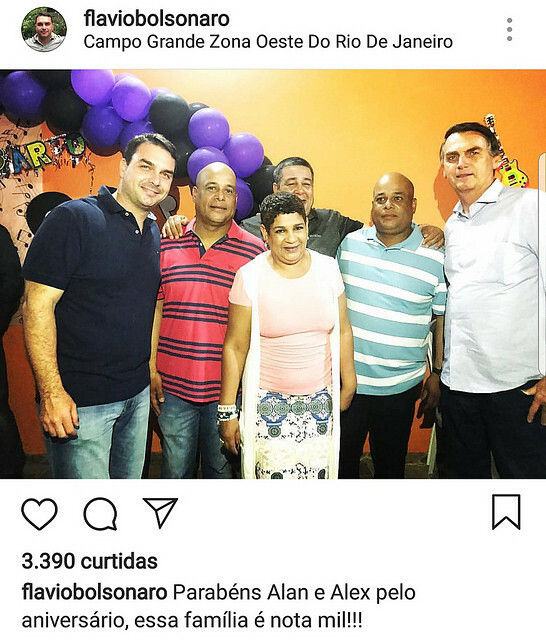 Around the same time, a photo spread on social media showing the then federal lawmaker Jair Bolsonaro and his son Flávio at the twins’ birthday party. While serving as state representative, Flávio proposed bills to regulate the militias. His father, in turn, has consistently reiterated his support for the torture inflicted by authorities during the country’s military rule, between 1964 and 1985, also stating that death squads would be “welcomed” in Rio. The police arrested on Tuesday five suspects in the murder of councilwoman and human rights activist Marielle Franco and driver Anderson Gomes: retired lieutenant Maurício Silva da Costa, major Ronald Paulo Alves Pereira, and the militiamen Laerte Silva de Lima, Manoel de Brito Batista, and Benedito Aurélio Ferreira Carvalho. A militia chief in Rio das Pedras and former captain of Rio’s elite police force, Adriano Magalhães da Nóbrega is also probed in the Untouchables Operation conducted yesterday. He is also a suspect in the murder of councilwoman Franco. His wife and mother were staffers in Flávio Bolsonaro’s office when he was state representative until November last year, a report showed.